No frills techno, express from Berlin. Since the start of the season, it’s the first weekend that we find ourselves swamped with options of a variety of parties and events. Different crowds and types of music have emerged, and most importantly different concepts have been born steering away from the standard dark room setting. Fractal is one of the promoters who debuted a few months ago, and who booked prominent international artist Makam. They’re coming back next weekend with Ryan Elliott, one of the household names in house and techno and one of the main residents of the infamous Berghain. 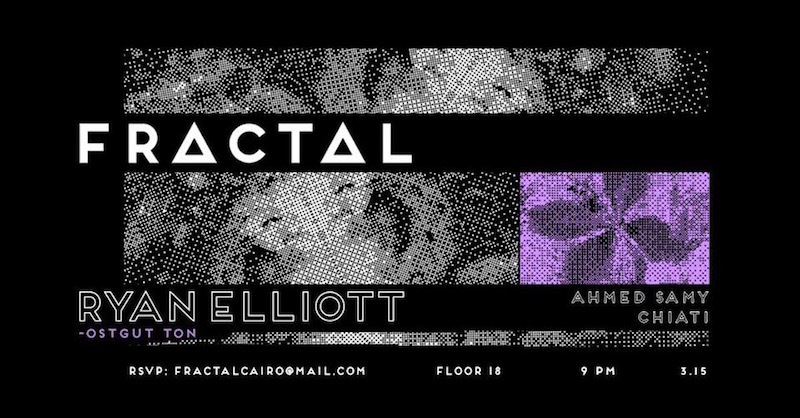 Fractal will be taking over the main room in Floor 18, Nacelle's latest venue where they have been throwing their House Sessions, so it will be interesting to see what this venue will become under the management of a different promoter. Ryan Elliott is an inspiration to many, and one who has found a perfect balance between the joy of house and the grit of techno, visual in the contrast of both his sets at the upstairs hedonistic haven Panorama Bar as well as the obscure dungeons of Berghain. Supporting Ryan will be Chiati, taking a break from his live sets to play a chilled out DJ set, as well as local veteran Ahmed Samy who will swim across an ocean of groovy beats and intricate counterpoint. Follow Ryan Elliott on SoundCloud. Follow Chiati on " title="SoundCloud" target="">SoundCloud. Follow Ahmed Samy on SoundCloud.